The Islamic Republic of Iran, the world’s number one state sponsor of terrorism, has been “fighting” the United States for almost 40 years. And for the same period of time American policy toward Iran has been to prevent the Islamic Republic from acquiring nuclear weapons. To advance that policy the United States Congress has imposed economic sanctions on Iran and past Presidents have made it clear that the United States was prepared to enforce that policy with all means necessary – implying at least the potential for military action if necessary to stop the Iranian nuclear weapons program. The nuclear weapons deal President Obama and Secretary of State John Kerry have “negotiated” with Iran discards that wise policy and, in conjunction with legislation written and sponsored by Tennessee Republican Senator Bob Corker, the Iran Nuclear Agreement Review Act of 2015, turns American constitutional processes for ratifying a treaty with other nations on their head. If a group of Americans act in concert to advance the purposes of a nation (the Islamic Republic of Iran) that has an avowed and public policy of acquiring a nuclear weapon for the purpose of fighting the United States is not committing treason, we invite those who disagree to suggest an alternative term. To those who accept the argument advanced by President Obama and Secretary of State Kerry that engaging the Iranian regime will “advance the cause of peace” we must observe that while Obama and Kerry readily ignore the Constitution of the United States there’s no evidence that the leaders of Iran are prepared to ignore the constitution of the Islamic Republic. And the Constitution of the Islamic Republic of Iran is quite clear on what the purpose of their government is; and it is not to preserve life, liberty and the pursuit of happiness and the blessing of liberty for its citizens and their posterity. The purpose of the Islamic Republic of Iran, and its armed forces, is to spread Islam across the world. It is foolish and dangerous in the extreme to assume, and to base a nuclear treaty on that assumption, that the world’s number one state sponsor of terrorism, governed by Islamist clerics, will ignore the call for worldwide jihad in their Constitution and in Islamic law once they acquire nuclear weapons. And make no mistake – it is the combination of Iran’s expansionist Islamism and nuclear weapons technology that is the threat. What would you call a group of Americans who acted in concert to throw away America’s “unassailable lead” in military power if not traitors? The Corker bill and Obama’s still secret nuclear weapons agreement with the Islamic Republic of Iran legitimize and advance the Iranian nuclear weapons program. 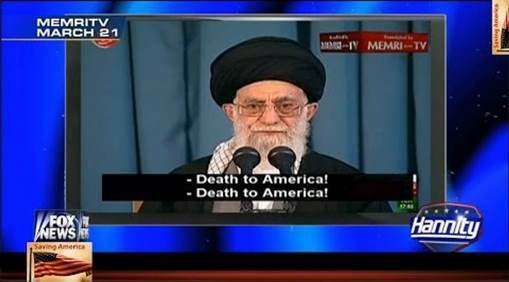 The result of this 180 degree change in American policy will be to hand to Iran the means of spreading their version of Islam across the Middle East and eventually the world – a goal they will readily pursue once they have the nuclear weapons that enable them to do so by deterring military action by the United States and other potential opponents. Defeating the Corker bill and stopping Barack Obama from legitimizing and advancing Iran’s nuclear weapons program by lifting economic sanctions against the Islamic Republic must be a top priority of conservatives. Republican leaders on Capitol Hill have once again betrayed conservative and constitutional principles and have indicated they will support the Corker bill – an abject betrayal of the Senate’s constitutional role in offering advice and consenting to treaties, that almost guarantees the acceptance of Obama’s deal to allow Iran to acquire nuclear weapons. Senate debate on the Corker bill has begun. The one alternative to the guaranteed acceptance Iran’s nuclear weapons program through the Corker bill is an amendment to that bill offered by Senators Ted Cruz and Pat Toomey. Their amendment (#1152) to the Corker bill* (the Iran Nuclear Agreement Review Act of 2015) would require affirmative Congressional approval of any Iranian nuclear deal before sanctions relief can occur. This approach uses the plenary constitutional power of Congress to regulate trade and commerce to restore the constitutional balance in the process and require Members of Congress to take an affirmative vote to overturn the policy of the past 40 years to prevent Iran from acquiring a nuclear weapon. We urge conservatives to contact their Senators and Representative (the Capitol Switchboard is 1-866-220-0044) to demand they vote for the Cruz-Toomey amendment to the Corker bill and against the Corker bill if Cruz-Toomey does not pass. *Our social media hashtag for the Obama-Iran nuclear weapons deal is #AprilFoolsDeal. Submitted by ONTIME on Thu, 04/30/2015 - 15:04. There is no doubt in anyone's mind WTP are running out of representation faster than we are running out of SSI money.....A Constitutional Convention may be a answer but it might turn out worse, another is to pull the responsibility for the care and maintenance of our Federal Senators from the grasp of the Fed Gov and return that responsibility back to the states. These folks work for the states but are corrupted by the fed gov..it needs to change.